Is AG Sessions unwittingly working for the Bush family? The incisive Facebook comment concerning Jeff Sessions posted below was recently sent to SOTN unsolicited. At first we disregarded it. But then we carefully looked at the Attorney General’s 6 month progress report since his confirmation on February 8th. 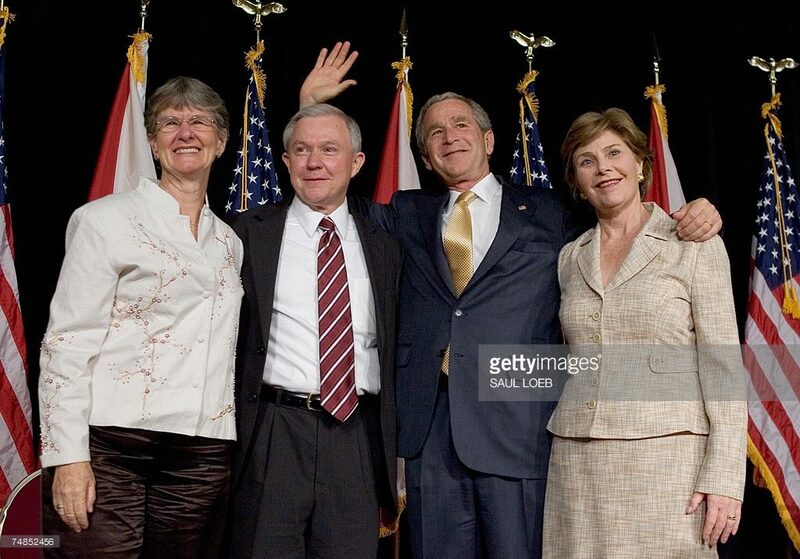 Because of the unmitigated disaster that Jeff Sessions has turned out to be as AG, one wonders whether he was actually sent into the Trump camp early on as a Bush family plant. Climbing on board the Trump train as Sessions did so early in the campaign season never made any sense; just as Chris Christie and Rudy Giuliani never really made any sense being anywhere close to Trump, except as spies. In any event, Trump may very well have been trumped by way of a classic Bush dynasty dirty trick. In light of what has transpired at the DOJ since his confirmation, it’s quite plausible that Sessions was sent in to infiltrate the Trump administration—plain and simple. Whether this occurred witting or unwittingly, however, is the big question. KEY POINT: It was Sessions’ DOJ that just released a significantly redacted record of the talking points that were listed in the aftermath of the Bill Clinton-Loretta Lynch improper meeting on the tarmac. Judicial Watch: Why did Session’s DOJ redact Clinton-Lynch tarmac meeting transcript? This type of official misconduct, which was rampant throughout the Obama administration, will never drain the swamp and only perpetuates the corruption. There is no debate about what has gone on at Justice under Sessions as being nothing short of catastrophic for Team Trump. However, it is what has not been implemented at the direction of the Attorney General that is even more disconcerting. Where are the prosecutions of criminal VIPs? Where are the warranted investigations into so much government criminality? It’s like the swamp creatures have been allowed to take over the whole place … as the AG himself aggressively goes after medical marijuana?! Why is Sessions so determined to go after medical marijuana, when the White House is under daily assault by political criminals and lawbreaking journalists? At this critical juncture (and late date), it really makes no difference whether Sessions is loyal or not to the POTUS. He displays a high level of incompetence as AG and palpable apprehension toward draining the swamp. Both of these profound deficits will prove to be fatal to Trump’s presidency. The President simply cannot afford such a weak character in the most powerful law enforcement position in the land. And especially not when the West Wing has been overtaken by every kind of swamp monster. Those agents of Deep State who aren’t swarming around the Oval Office are busy executing Soros’s Purple Revolution in the streets. All the while AG Sessions seems to stand alone within the DOJ in his lip service to draining the swamp. Remember, the Bush political dynasty always seeks to control the opposition either covertly or overtly. Hence, it’s entirely possible that good ole Jeff is a marionette on a string, and he doesn’t even know it. That’s how the C.I.A. prefers to run such a critical psyop like this. It’s always better to control the enemy through the agency of an inside dupe who doesn’t even know that he’s being managed. If the DOJ under Sessions is still owned and operated by Deep State, then Trump has no choice but to get rid of him post-haste. More importantly, he needs to take advantage of making a recess appointment this August once Sessions is fired. That termination has to take place almost simultaneously with the appointment of a new pit bill of an AG. The Trump presidency greatly depends on a swift and decisive move in this particular regard. Anything short of Trump’s special brand of presidential jujitsu will likely be met with countervailing measures that have already been planned by the treasonous Democrats. BOTTOM LINE: It’s time for Jeff Sessions to go! Trump needs a pit bull AG. Caveat: The vast majority of RINOs in Congress do not want Trump to fire Sessions. This alone is quite worrisome. Many of them have come to Sessions’ defense with nothing but laudatory platitudes. Meanwhile, the Democrats and their MSM organs of propaganda have been even more vocal about a Trump “Saturday Night Massacre”. It’s as though the power elite of Washington’s establishment does feel sufficiently secure with Sessions as AG. UNLESS YOU HAVE WORKED THE UNDERBELLY OF THE SYSTEM AS I HAVE….ONE CANNOT GRASP THE FACT THAT POLITICS IS WAR BY ANY OTHER MEANS…. SESSIONS WORKS FOR THE BUSH FAMILY AND THEY HATE TRUMP WITH A PASSION…. SMART AS TRUMP IS IN MOST AREAS NOTHING CAN TAKE AWAY THE FACT THAT HE IS A ROOKIE AND ALL ROOKIES IN ANY FIELD MAKE BIG MISTAKES….SESSIONS IS ALSO A SPY FOR THE SENATE HAVING SPENT MOST OF HIS LIFE IN THE SENATE WHO DO YOU THINK SESSIONS HAS DEEPEST TIES TOO…HIS SENATE FRIENDS OF COURSE…. AND THE GUY HAS PERFECTED HIS DOWN HOME SOUTHERN CHARM SOFT SPOKEN B.S. ROUTINE TO THE POINT WHERE HE GETS OVER ON JUST ABOUT EVERYONE….WHICH IS TO BE EXPECTED….SESSIONS IS A CONSUMMATE PROFESSIONAL POLITICIAN…SADLY JUST NOT TRUMPS POLITICIAN ANOTHER SUPER SERIOUS MISTAKE TRUMP MADE AS A ROOKIE WAS APPOINTING ANOTHER BUSH LOYALIST AND PROGRESSIVE IN ROD ROSENSTEIN WHO THE SECOND SESSIONS RECUSED BAM…ROSENSTEIN APPOINTS MUELLER WITH ALL THE POWERS OF A SPECIAL PROSECUTOR…. TRUMP HAS NO BENCH POLITICALLY TO CHOOSE FROM OTHER THAN HIGHLY RESPECTED AND VERY TALENTED MILITARY GENERALS….THOSE PICKS DO HIM TREMENDOUSLY WELL…..BUT TRUMP JUST MADE ANOTHER SERIOUS ROOKIE MISTAKE IN APPOINTING ANOTHER BUSH FAMILY LOYALIST AS FBI DIRECTOR IN THIS GUY WRAY…. AND THIS TOO WILL COME BACK TO BITE HIM HARD….HE SHOULD HAVE CHOSEN ANOTHER GREAT GENERAL LIKE 4 STAR STANLEY McCHRYSTAL OR GEN. DUNFORD!!!! GREAT GENERALS LIKE THESE CAN BE TRUSTED BECAUSE THEY BELIEVE IN THE CHAIN OF COMMAND AND THE PRES. IS THE VERY PINNACLE OF THAT CHAIN OF COMMAND…. MY FATHER ALWAYS SAID YOU WILL MAKE MISTAKES JUST DO NOT MAKE A FATAL MISTAKE….TRUMP IS ON THE SCALPELS EDGE OF A FATAL MISTAKE….HE SEEMS TO BE UNABLE TO GET RID OF SESSIONS SO HE MUST GET RID OF ROSENSTEIN AND PUT RACHEL BRAND IN ASST DEPUTY AG….THEN SHE CAN APPOINT A SECOND SPECIAL PROSECUTOR….AND/OR FIRE MUELLER FOR CAUSE….CONFLICT OF INTEREST ABOUND…. SHE WOULD BE 100% WITHIN HER RIGHTS TO FIRE MUELLER BUT A SMARTER PLAY IS TO HIRE A VERY AGGRESSIVE 2ND SPECIAL COUNSEL WHO SUPERSEDES MUELLER’S MANDATE SO HE HAS TO CLEAR EVERY MOVE THROUGH THE 2ND SPECIAL COUNSEL…THAT WAY NO BAD PR FOR FIRING HIM AND SHE BECOMES THE SUPERSTAR THAT SHE ALREADY IS!